VH-OJA will soon take off on its final flight. Qantas has dotted every ‘i’ and crossed every ‘t’ ahead of the retirement flight for its first Boeing 747-400, VH-OJA. All that is left to do now is hope for good weather on Sunday. Qantas is gifting VH-OJA City of Canberra, which flew non-stop from London to Sydney for its delivery flight in 1989, to HARS (the Historical Aircraft Restoration Society) to go on display at Illawarra Regional Airport near Wollongong. The Qantas pilots at the controls for VH-OJA’s retirement flight, which has been given the special flight number QF7474, have spent 25 hours in the simulator preparing for Sunday’s landing at the aircraft’s new home. 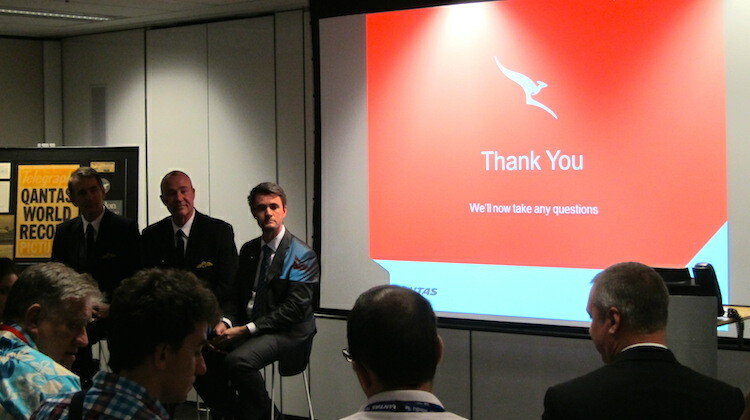 Qantas Captain Greg Matthews will be the pilot in command for the delivery flight and he, along with Qantas head of flying operations Captain Mike Galvin and Qantas executive manager for corporate affairs and communications Andrew McGinnes hosted a briefing at the airline’s Mascot headquarters on Thursday for reporters, bloggers, industry representatives and aviation enthusiasts. The trio told the assembled gathering the aircraft would land at Illawarra Airport from the north, touching down on Runway 16, which measures a little over 1,800 metres in length. Qantas has received approval from Boeing to reduce the tyre pressure from 208 psi normally to 120 psi to reduce the impact on the runway, and in fact the 16 wheels on the main landing gear would exert less pressure on the runway than HARS’s Super Constellation. Captain Matthews said there was plenty of runway length for VH-OJA to land and the flightcrew were not planning to use reverse thrust, just idle thrust. This was due, in part, to the runway’s 30-metre width, meaning the outer pair of engines on the 747 would be over grass, leading to the potential of stones or other debris being sucked into the engines. 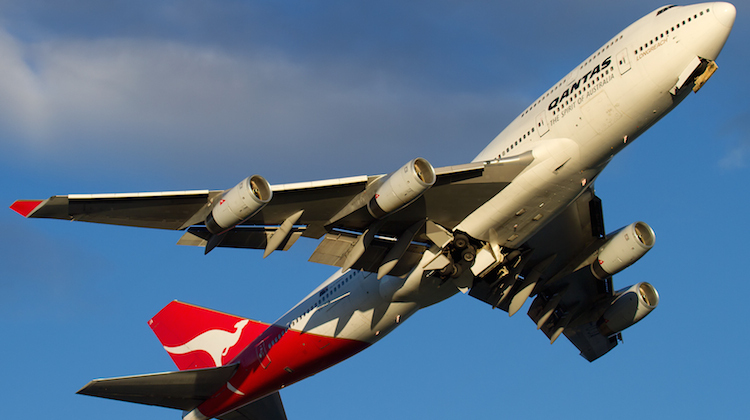 Three of the engines still had “commercial value” and were due to be removed off the aircraft and returned to Qantas to be used as spares for its fleet of 11 remaining 747s. One engine will remain with the aircraft. The flightcrew will fly a visual approach into the airport where CASA has declared temporary restricted airspace within an eight nautical mile radius up to a height of 4,500 feet. Sundays were usually a busy time at the airport, with plenty of light aircraft, hot air balloons and other assorted general aviation movements at that time. CASA also sat in with the pilots during the flight simulator sessions and has given its tick of approval to the flight proceeding. VH-OJA is expected to take off for Sunday’s delivery flight at 201,000kg, far lower than the 747-400’s maximum takeoff weight of 397,200kg. The reduced weight also means the approach speed of VH-OJA prior to landing would be lower than usual at 132kt, compared with 180kt normally. The galley carts have been removed from the cabin, and all potable water taken off the aircraft. The delivery flight is subject to weather conditions and will not proceed if there is a northerly wind, a crosswind of greater than 10 knots or if clouds prevent a visual approach. Moreover, the landing will not be attempted and the aircraft will return to Sydney should conditions change after takeoff. VH-OJA was expected to touch down at 0747 local time. Qantas’s briefing for the VH-OJA delivery flight. Presumably 3 time expired engines will be put on the aircraft to replace the 3 removed. QF’s operating 747s have a mix of RR and GE engines, so the engines to be removed won’t serve as spares for all 11 aircraft. I think VH-OJA is RR and 4 of the remaining 11 are RR. Hopefully, they will indeed replace the 3 time expired (but stil working) engines to replace the 3 valuable. Nevertheless I’m glad to know that this 747-400 with flight record on its name will be preserved. I left RR Derby UK in 1989 and my workmates gave me a framed photo of VH-OJA.. I feel very proud that some of my bits were in the greatest engines on the greatest plane ever produced. To add to what Greg said the 747-400’s in Qantas’s fleet have RR engines while the 747-400ER’s have GE engines. A very important Gift by Qantas and one that will be enjoyed for decades. Qantas has a special place in PNG because when I first came to PNG in 1966 Qantas Cadet Pilots were seconded to Territory Airlines Limited to fly Cessna Aircraft around PNG and get experience and “get their hours up” before returning to Qantas and continuing their flying career. One of those chaps in my time at Goroka, in the Eastern Highlands, was Graham “Sandy” Howard and he went on to fly the B747 so I believe and now flies the Super Constellation for HARS I have heard. Great Airline. and great work Qantas. I look forward to visiting the Museum sometime soon. Being a foundation member of HARS I am very proud of the progression of “OUR ” Society and the thankless work Bob and all the guys and girls have put in over the decades to make this organisation a world class aviation flying museum. Today’s ( Sunday 08 May 2015) historic retirement flight of OJA is the pinnacle of achievement for all concerned, our HARS people, QANTAS and CASA and the many other “Doers ” attending to the myriad of tasks to make this day a total success. Not only is this aeroplane a record holder for the longest non stop flight of a commercial airliner but I also believe OJA now holds the record for the shortest delivery flight. Who would have thought that a small bunch of ” aeroplane nuts ” meeting in various lounge rooms 35 odd years ago would spawn such a great and successful keeper of living Australian aviation history. Well done my fellow members, you all have made me and, all the other originals I’m sure, so very proud. Like Colin, I too was part of the RR manufacturing team in Derby which made the engine components. Very proud to have been associated with a great engine, plane and company. Whist attending college as part of my job training we saw this magnificent plane fly over prior to its departure to australia – this awesome sight of power and grace was only equalled when seeing Concorde fly over whilst at school. March 9, 2015 at 06.57 pm. So enjoyable reading! Thanks! 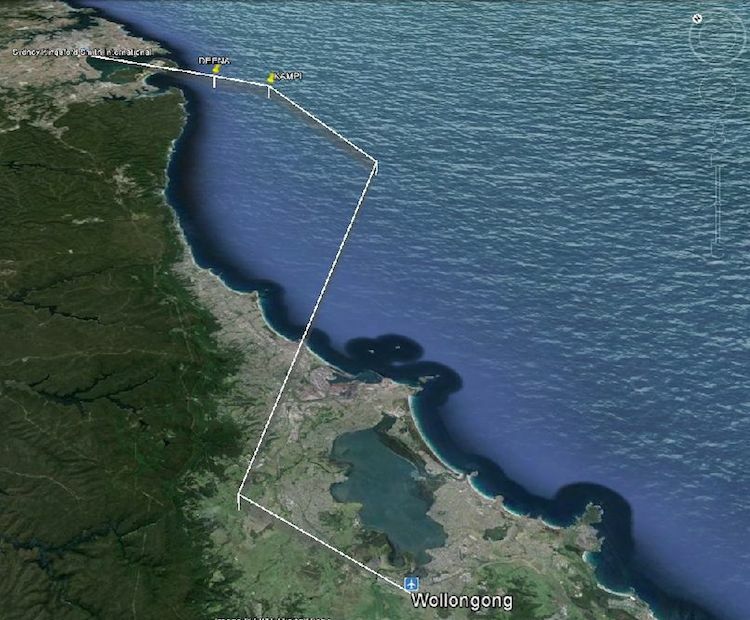 I came across reading about this last flight event of Qantas Boeing 747 VH-OJA for delivery Illawarra, Sunday 8 March 2015 off Flightradar24. Could some person with knowledge about the record held by VH-OJA, “longest non stop flight” please detail to me? Johannesburg – Sydney. What a delight to see these awesome planes! I notice that many of the comments about Qantas in the past few months are positive and rightly so. Well done QF on giving your 400 a fantastic final Parking Bay. I am sure it will be treasured and appreciated by your museum members! You lucky museum members!! As a member of an aircraft museum here in South Africa. We are based at Rand Airport Germiston near Johannesburg. We unfortunately have nothing like a 400 nor the 300. We do however have a 747 SP (SB) and SAA’s 1st 747-200 (Classic). It retired after 32 years of service! Good luck to the museum members.